The Environmental Protection Clinic is an interdisciplinary clinic that addresses environmental law and policy problems on behalf of client organizations such as environmental groups, government agencies, and international bodies. The clinic covers the full range of environmental issues but houses two issue-specific programs. The program on climate change and energy addresses issues related to the science and policy of climate change, including international law, local permitting, and ocean science and policy. The program on food and farming supports clients that work for an environmentally friendly, healthy, and just food system. There are two components to the Environmental Protection Clinic: client-oriented project work and a weekly seminar. Students are given the opportunity to rank the projects on which they wish to work and then, based on their preferences, grouped into a 2 to 4 person team to work for a single client throughout the semester. The seminar meets weekly and alternates between lectures on the tools of environmental protection and project-specific workshops and meetings. Students taking the Environmental Protection Clinic for the first time must take the course for 3 credits, attend the seminar, and work 10–12 hours each week on their client project. If students continue in the Clinic beyond the first semester they need not attend the seminar and may take the Clinic for 1–4 credits. Instructors: Josh Galperin, David G. Hawkins, and Lisa Suatoni. Working with the New Haven Food Policy Council to identify ways for incorporating food issues into the City of New Haven’s Comprehensive Plan. Students worked with the Council to write a detailed letter to City Plan (New Haven's planning department) on opportunities for better planning around food access, food justice, and the environmental impacts of food in New Haven. The students and clients then formally presented their findings to City Plan to advance the comprehensive planning process. Partnering with the Futaleufu Riverkeeper in Chile to protect the Futaleufu watershed. The Futaleufu Riverkeeper is the first Waterkeeper organization in Patagonia. Students work with the Riverkeeper to explore opportunities for increased energy efficiency and renewable energy in the Chile as an alternative to developing new and ecologically disruptive hydroelectric projects along the Futaleufu River. Supporting the Yale Climate Change Dialogue to raise the trajectory of international climate change negotiations and increase ambitions around the 21st Conference of the Parties to the United Nations Framework Convention on Climate Change. Students worked closely with the clinical faculty and Professor Dan Esty to support this collaborative project that brings together climate change thought leaders from five continents to brainstorm better ways to solve the climate change problem. Teaming up with the US Environmental Protection Agency’s Office of Environmental Justice to research practices that advance consideration of environmental justice in environmental reviews under the National Environmental Policy Act (NEPA). Among other things, students helped draft a Compendium of Terms on Environmental Justice and NEPA as Applied by Federal Agencies. Student efforts were in support of the NEPA Committee of the Federal Interagency Working Group on Environmental Justice. Working with the Sierra Club to explore the impacts of changing energy patterns in New England. In particular, Clinic students are focusing on the roles for natural gas, renewables, and energy efficiency in the ongoing clean energy transition and developing comments on efforts by southern New England states to engage in coordinated procurement of these resources. Collaborating with the Natural Resources Defense Council to study industrial agriculture across the United States. Using data obtained through a Freedom of Information Act request, students have developed a comprehensive database giving new insight into the extent of industrial agriculture across the country, are helping develop a public-facing website built from this new data, and are offering new policy options for managing the environmental and human health impacts of industrial agriculture. 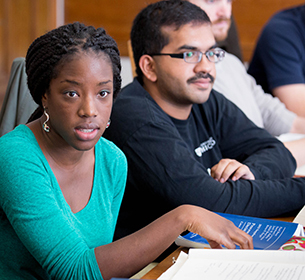 Yale Law School offers more than 30 clinics that provide students with hands on, practical experience in the law on a diverse range of subject matters. 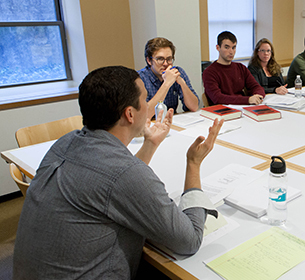 Yale Law School offers a suite of innovative simulation courses based on real-world case studies. 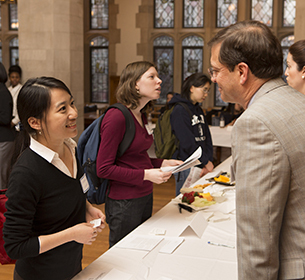 Yale Law School enhances the intellectual life of its academic community by sponsoring a variety of centers, programs, and workshops, inspired by the interests of its faculty and students.